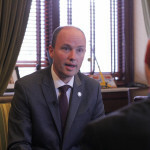 Education is a hot topic in politics in Utah, especially in relation to the growing push for STEM (science, technology, engineering and mathematics) and art education in the state. Lieutenant Governor Spencer Cox says that he understands the importance of technical fields as they become more sought after, but he also recognizes the importance of the arts. To increase potential applicants for technical fields going unfilled, science, technology, engineering and math (STEM) programs were created to encourage students to pursue technical careers. David Ferro, who is the dean of the Engineering, Applied Science & Technology College (EAST), says that many jobs in the STEM field don’t get filled. While there has been a push in recent years toward STEM education, there still remains a lack of skills when it comes to filling these positions. “STEM has done a lot of good; we want to merge art with STEM and make it better,” Professor Robin Haislett, advisor to KWCR and professor of visual communications, said. Dean Ferro spoke about the effectiveness of STEM and the work EAST does on campus and in partnership with other organizations. Haislett believes that scientific minds and artistics minds are similar to each other. “They just look at things differently,” Haislett said. Longtime advocate for STEAM, the merging of arts and STEM, is Erik Stern, who is a performing arts professor at WSU. Professor Stern, along with two colleagues Julian Chan and Rachel Bachman, ran a pilot course during fall semester in 2014, combining math 1030 and dance 1010. The pilot course proved successful and is currently scheduled to be available in spring 2017 for general enrollment. Ferro believes WSU does cover the need with general education requirements. “I don’t know if we need STEAM, as long as we have this concept of liberal arts and general education,” Ferro said. Drew Tyler, advisor to studio 76 and digital media instructor at WSU, believes the concept of STEAM should begin with K–12 by encouraging an artistic side from an early age. “If students, kids, young kids, don’t have that opportunity… they’re really not looking for it,” Drew Tyler said. Stern says the focus should be on improving the student, not just the mind. Haislett believes that STEAM needs to revolve around finding ways to give students the necessary skills to fulfill the ever-changing demands of the workforce. Haislett thinks individuals should be well-rounded and able to communicate their ideas effectively. While there is not one solution to the problem, Ferro believes that students from all majors would benefit from some form of art education. “I think any student would benefit from art, even engineers,” Ferro said. 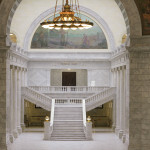 The Rotunda and stairs that lead to the second floor and Supreme Court of Utah at the Capitol Building in Salt Lake City. 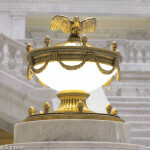 A light ficture on the marble staircase leading to the second floor of the Capitol Building in Salt Lake City shows an eagle ready to take flight. 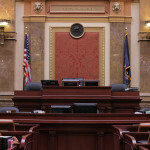 The House of Representatives Chamber at the Utah State Capitol Building in Salt Lake City. 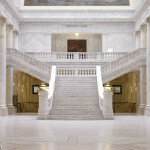 A marble staircase that leads to the Supreme Court of Utah at the Capitol Building in Salt Lake City. Lt. Gov. 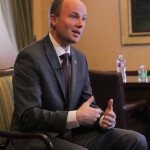 Spencer J. Cox responds to questions about his roll in education in Utah. Lt. Gov. 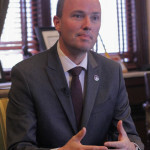 Spencer J. Cox speaks about making education his number one priority in Utah. Lt. Gov. 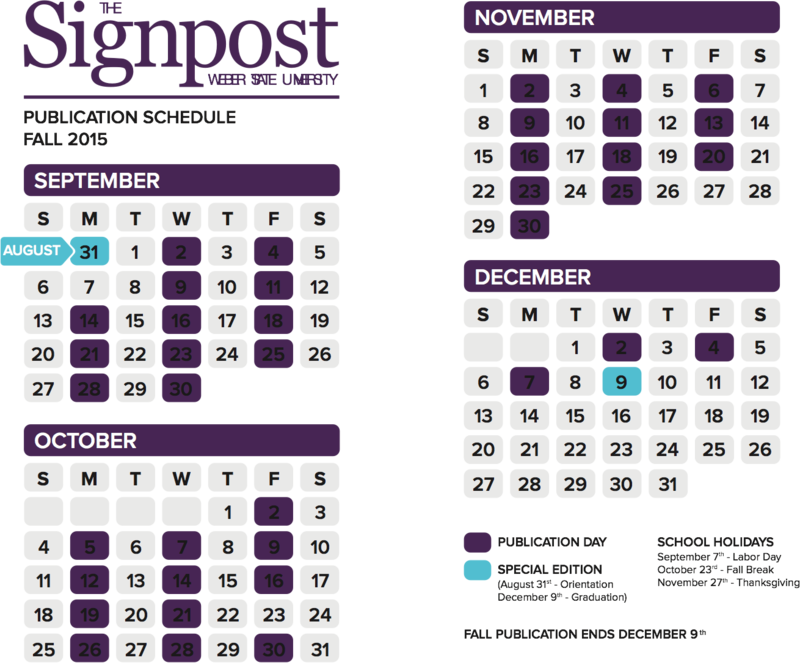 Spencer J. Cox sits down with The Signpost reporter Tyler Hoffman to speak about the STEM to STEAM education transition.